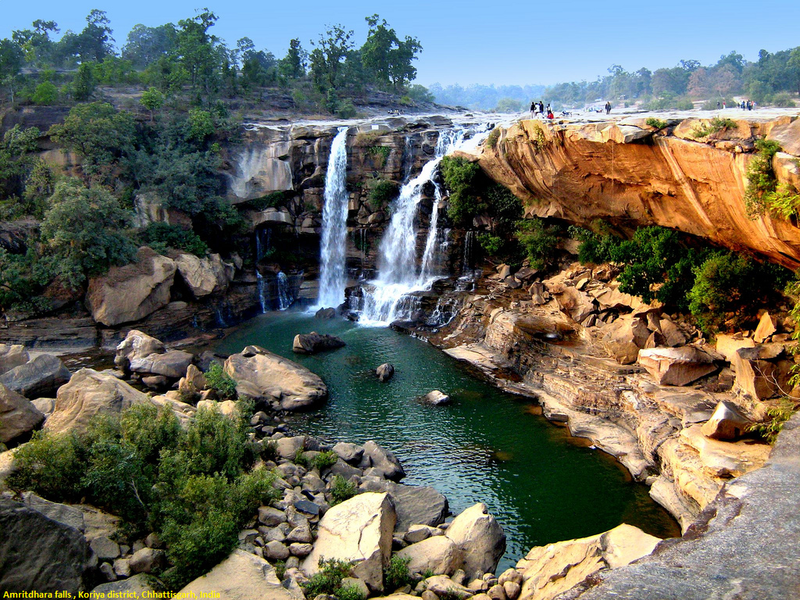 Amrit Dhara is a natural waterfall in a located in Koriya district, state of Chhattisgarh, India. It originates from the Hasdeo River, which is a tributary of the Mahanadi River. The fall is situated at a distance of 17 km from Chirmiri. The waterfall is ideally located on the Manendragarh-Baikunthpur road. The Amrit Dhara Waterfall in Koriya in Chhattisgarh in India falls from a height of 90.0 ft (27.4 metres). The waterfall is about 10.0–15.0 ft (3.0–4.6 metres) wide. Chirmiri is a hill station and a Municipal Corporation in the Koriya district of the state of Chhattisgarh, India. Chirmiri is a very beautiful hill station and green city.Chirmiri is one of the Chhattisgarh cities located in the Koriya district of the state of Chhattisgarh. The region is renowned for the coalmines that are situated in the town. Chirmiri has earned the position of being the second largest Crane in the continent of Asia. The religiosity of the people of the city of Chirmiri is reflected in the temples constructed in the region. The city of Chirmiri is located in the geographical coordinates of 23 degrees 11 minutes and 60 seconds north latitude and 82 degrees 20 minutes and 60 seconds east longitude.